This highly energetic, awesomely fun sport is a favorite pastime of many dog-parents and their four legged companions. It’s one of the best ways to exercise and have some fun in the sun for the both of you. Catching and throwing a flying disc is a skill that must be gradually learned and practiced by both you and your pet and this short guide will tell you how to start. Who knows, maybe after some practice you might even compete in championships held regularly all around the world. The sport is also known as disc dog (American company Wham-O trademarked the name “Frisbee”). Before starting the game you must choose your props wisely. Ordinary discs used by humans might easily hurt your beloved pet. Remember – they are catching them with their mouth, not their hands (or paws). 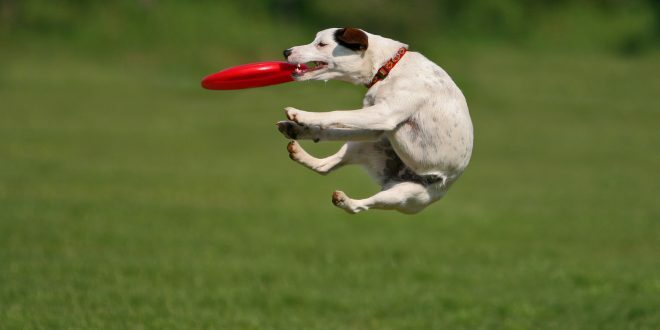 Frisbee discs for dogs are usually softer and have edges that are designed for easier and stronger grip with the teeth than those that humans play with. Very hard surface and design that doesn’t cater to dogs abilities and needs could damage their mouth, snout and teeth. 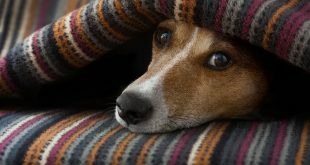 You must also take into account if are you an owner of a larger or a smaller breed, a dog that loves to chew and has a strong jaw, or one more sensitive in that area. Luckily there are many variations of flying discs that are designed specifically to cater to the needs of various breeds. Not all dogs will know what to do with the strange round piece of plastic at the first glance. You must show them what fun lies in that unassuming object. Start by familiarizing your dog with the disc. The best way is to use it as a food bowl, or a water bowl for a few weeks before you start training. Just don’t forget to wash it before you start throwing it around. When you get the feel that your dog is comfortable around the disc you should start playing with it by encouraging him/her to smell it, bite it, chew it, etc. 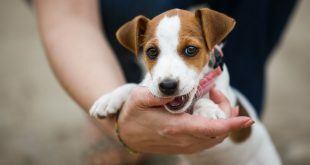 The best way is a game of tugging – hold one end of the disc in your hand while your pet has the other firmly in their bite and start tugging around and being energetic and positive about the whole experience – make the experience exciting and pleasurable for them. Be happy and show it out loud by verbally appreciating their efforts – that will encourage them to like it even more. After they develop a sense of excitement for the disc itself you should start gradually teaching them how to catch and fetch the frisbee. Start by rolling the disk on the ground towards them so that they get accustomed to the movement of the disc – don’t expect them to catch on right away. You might roll the frisbee many times before they try to grab it while moving. Once that happens repeat the process many times and applaud them with a happy and excited tone. Catching the disc in mid air with your mouth isn’t a small feat so start slowly. For starters kneel on the ground a few feet away from the dog then throw the frisbee gently towards them. Throw the disc horizontally in front of your pet and not directly at him – you don’t want to scare or accidentally injure your beloved buddy. When they start coming at the frisbee and try to grab it in the air give them lots of praise. With time you will gradually begin to make longer and stronger throws and could even try out doing some tricks with the disc (different angles, rotations, etc.). Watch out for the direction and force of wind – if you toss the disc downwind it will go faster and with more force than you maybe intended, on the other hand if you toss it upwind expect the opposite. Generally it’s best to throw the disc across the wind, when it’s calm or a mild breeze, to maintain the best control. Throw and catch is a style that, as the very name suggests is based around the proficiency of the owner and the dog to work together and collect as many points in throwing and catching the disc in a limited time period. Long distance is a style in which the goal is to throw the disc as far away as possible and your pet must run after it and catch it before it hits the ground. The world record is currently held by Rob McLeod and Davy Whippet who managed to catch the disc at the distance of 134 yards (402 feet). Freestyle is a wonderful show of skill and preparation. The owner and their dog must develop a whole routine around a musical number and show of their dedication and teamwork through an exhibition of various elements performing a ballet of speed, precision, agility and showmanship. Following this simple advice you will be having awesome fun with your beloved friend in no time. 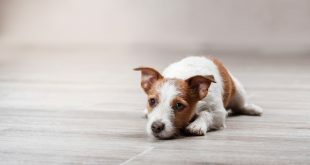 Excellent for highly active breeds like Jack Russell Terriers and Border collies, it’s a democratic sport in which everybody can participate no matter their size, age, color, speed and agility. It’s all about having a good time.